The oral tradition in Caribbean culture is one of the strongest features of our literary heritage. A significant element of the region’s culture is embodied in our inventive use of language - in everyday conversations, limin’, on the streets, in maxis and taxis, in the markets, in Speech Bands, in the carnival kaiso tents, in the lyrics of our calypsonians and soca artistes, and the vernacular of our radio DJs and MCs – all modern day chantwells, griots or oral historians. The tradition is also maintained in the contemporary Spoken Word scene where younger writers sharpen their skills in verbal battles and lyrical masterclasses drawing on topics from a deep well of often searching and controversial subjects. Mutabaruka and the late Michael Smith from Jamaica, Paul Keens Douglas or Sprangalang from T&T are amongst the most celebrated Caribbean wordsmiths. Currently, Crystal Skeete is one of Tobago’s acclaimed poets/Spoken Word artists. A doctor by profession and former T&T track and field athlete whose most famous piece Maxi Man has been seen almost 90 000 times in YouTube hits. She’s one of a posse of T&T writers who comprise the Free Speech Project poets[i]. 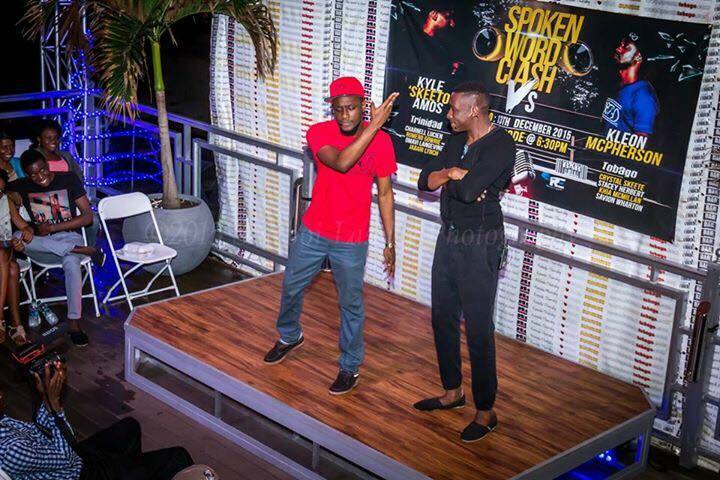 Amongst the thriving Tobagonian cabal of Spoken Word artists secondary school teacher Askala George won the 2015 Spoken Word Festival held at Gulf City Mall in December, where categories for both Young Adults and People’s Choice were well represented. The annual event, inaugurated in 2012, focusses on literacy, education, books and reading and is a collaboration between the Empowerment Foundation of Tobago, Mood Writers, Tobago Ingenium Debate Forum and Tobago Writer’s Guild. Another standout face in the island’s Spoken Word milieu - and also a Free Speech poet - is Kleon McPherson. One of his most celebrated performances occurred in a double header clash during December at the Trinidad Theatre Workshop in Belmont and Bar Code in downtown Scarborough, respectively. Over a long weekend where the lyrical assassin’s biting and ruthless delivery - with content to match - achieved the verbal laceration of arch rival Kyle ‘Skeeto’ Amos, both performers brought expert and astute word play and observations to a captivated audience, together with topical and sharply witty verses. In the end though it was McPherson who eclipsed his opponent over several closely fought sessions. The well informed intellectual combines his Spoken Word performances, with a career as a Researcher in the Administrative Offices of the Secretariat at the Tobago House of Assembly Legislature Building, in uptown Scarborough, where he has been employed for around 8 months after transferring from the Community Development and Culture Division. I met up with the articulate writer recently and learned more from him of the history and background of the Spoken Word genre in T&T and his role and continued participation in it. Hailing from Carnbee, where he still lives, and with links in Plymouth, the writer’s distinctive tones can also be heard on several radio and TV adverts, and he was recently featured in a Christmas special featuring many Trinbagonian entertainers. McPherson is too modest to state whether he himself or Amos triumphed at December’s poetic jousting match but it is widely acknowledged to have been a victory for the enthralling and assured performance of the smaller island’s contender. A review of his captivating YouTube productions, and of the recent clash, capture a performance style which requires more than one adjective - composed, acerbic, passive aggressive in delivery, sardonic, lucid and with clear diction – and extremely entertaining. The double award winner – he picked up Young Achiever of the Year and Youth Awards [Performing Arts] last year - also runs RE Promotions which coordinates charity work and schools’ supplies and is dedicated to enhancing the cultural and entertainment landscape of Tobago by promoting the island as a top choice destination for social activities and events. Active in the Spoken Word scene in T&T for nearly 5 years he recalls his early days - overcoming scepticism that the scene was elitist and not for him - describing an interest which began almost by accident. Having studied at The UWI’s Cavehill Campus, where he attained a Bachelor of Arts degree in History and a Masters in Cultural Studies, it was at that institution where his debut performances saw him recite the pieces entitled Leggings and A Hot Shhh [of which more later]. Pointing to the sometimes limited focus of many of his Spoken Word peers – racism or Black consciousness for men, and domestic violence and sexism for women - he sees himself as unique and different in his performance style rather than attempting to fit into a specific category. Describing himself as an organic intellectual, rather than an academic minded writer and citing Tobago’s Mood Writers and The Def Poetry Jam TV show as early influences, he has now established a distinctive style which he describes in this way: “I favour precision in my delivery and the same standard in my writing”. His verbal self-portrait is accurate and although he mostly stays away from mainstream politics in his poetry, omitting any commentary about political parties from of his work, that doesn’t mean that his work is not penetrating or enlightening. Black – which he describes as his most serious work, illustrates this assertion, as does Su Ling a message piece, whilst Skin Deep depicts the contradictions of the high-powered glamourous fashion world, and A Vagrant’s Plight contrasts Caribbean plantation society with the metropolitan societies of western Europe. Versatility, as well as accessibility, is important to any writer and one of McPherson’s pieces - A Hot Shh – achieved both popularity and a number one spot on a local song chart. He has also delivered his work to Tobago Jazz Experience, performed at Machel Monday during Carnival and is often kept busy with performances during the Emancipation Day period. Versatile in writing and skilled in a broad cultural arena as stilt walker, carnival band leader, and cultural researcher, [tenor] pan player with Bethel’s RDC Redemption Sound Setters, the 2014 Verses Bocas Poetry Slam [ii] Finalist [now First Citizens National Poetry Slam] was also featured in the Caribbean Beat Magazine March/April 2015 issue. Having recently announced a possible collaboration with the legendary Paul Keens Douglas expect big things from this versatile performer and writer. The Caribbean oral tradition lives on. [i] T&T Radio Station 96.1 WE FM, features Spoken Word poets four times a day in its Free Speech Project segment. The writers’ videos are uploaded to the network’s YouTube channel, and are also featured on the station’s Facebook pages. [ii] NGC Bocas Lit Fest, Trinidad and Tobago’s annual literary festival, hosts the Verses Bocas Poetry Slam, sponsored by First Citizens bank.